L-R: Assistant Director, International Cooperation, Ministry of Budget and National Planning, Simon Ahonsi; Commissioner for Water and Energy Resources, Hon. Yekini Idaiye; representative of Edo State Governor and Deputy Governor, Rt. Hon. 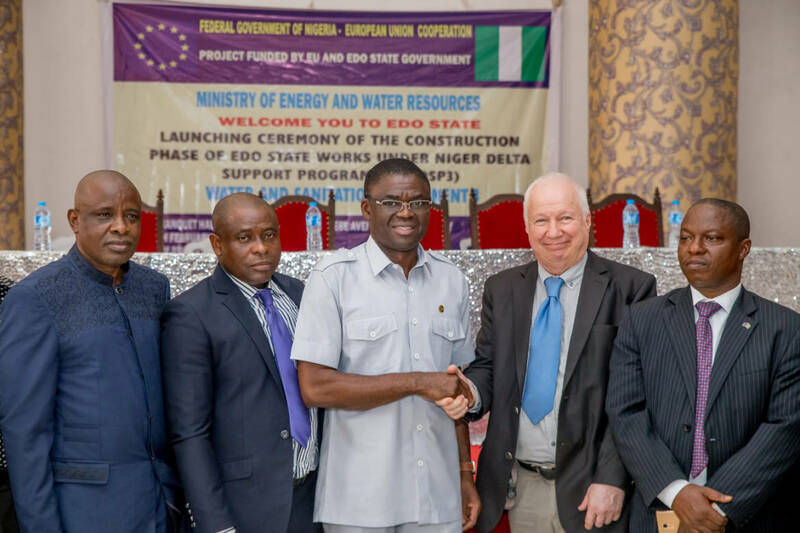 Comrade Philip Shaibu; Team Leader, Niger-Delta Support Programme (NDSP)-3, Albert Achten; and the Desk Officer, NDSP-3, Olanrewaju James Opanubi during the flag-off of implementation of the construction phase of European Union (EU) NDSP-3 Water and Sanitation projects at the Government House, in Benin City, Edo State, on Monday, February 5, 2018.